Step Away From the Cake: ERIN GO BRAGH!!! On to serious things. Today was swimming. I had planned a fairly light day; 200m warm up working on form, 500m at (what I think is) race pace, 300m drills; that was it. I did the 200m warm up and felt like I was just gliding through the water. Total Immersion says to roll and glide slightly with each stroke and reach with your stretched out hand. I was really working on reaching and rolling and just felt like I was going really far on each stroke - I like that feeling. Then I did 500m at what I think race pace will be. I didn't try to go superfast but I tried to keep it up so I was a little bit out of breath but tried to hold it pretty steady. When I finished the 500m my right hand was numb. Ummm, this is not right. I stopped and stretched out my shoulder and it a minute it was fine. So I started to do my 300m of drills and within 50m the hand was numb again. I stopped and stretched and it was fine again. So I did 200m super slow working on really good form and trying to just use the range of motion in my shoulder to stretch it out a bit. At a certain point in the stroke I could feel a twinge of numbness, it would just come and leave really quickly. I decided not to push it and called it a day. As I was showering I was thinking about the numbness and wondering if I should go to a doctor, maybe I had done something to it, I was a little concerned. Then, as I was shampooing my hair, I heard a crackling noise in my shoulder and it all came back to me. Back in my early 20's I fractured my clavicle on the right side and over the years arthritis has developed in that shoulder area. Whenever I switch my strength training routine my shoulder acts up. Usually I get pain in the clavicle or back of the shoulder, I'm fairly certain this is just a new manifestation of an old injury. So I only got in 950m but I figured it's better to rest than to push it, especially with my first race in 9 days. Totals: 950m in 29:29 minutes. Not too shabby considering I was working under a handicap. So I successfully made it through one solid week of training. Tomorrow is my rest day, actually I'll probably be moving and painting, and Sunday I have got to get a serious brick in. 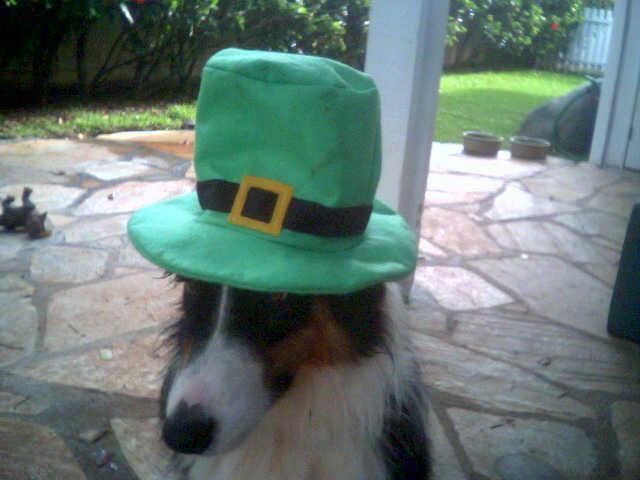 Hope everyone has a great St. Patty's Day; tonight there will be beer!!!! Cute puppy! When my boys showed their dogs (Labs) in 4H, there were always a lot of Aussies. They are one smart breed! I wonder if chiro or massage would work for that shoulder? It sounds like a hassle. I'm always a little spooked when my body makes noises that it shouldn't! i think that dog looks better in hat than i do!